I love this…whatever it is!!! It is in our entry way. Above it is a chandelier. We don’t know how to clean the glass in the chandelier. It is way too high up there. I don’t think there is a ladder that high. We have tried to pay people to clean it but so far…no one really wants to. Lucky for us none of the bulbs have ever burned out. now that I have said this out loud and in print…that just might happen. My husband bought this for me from my favorite store. It was handmade by a craftsman who gathers doors and porch railings and knobs and kitchen shelves from old houses and then arranges them all together into pieces that look like the one above. I don’t even know what to call it but I love it. I think that it must look not pretty to some people. I have family photos all over it so that every time I walk by I see my mom and dad and my sister and my brothers and my beloved pets. 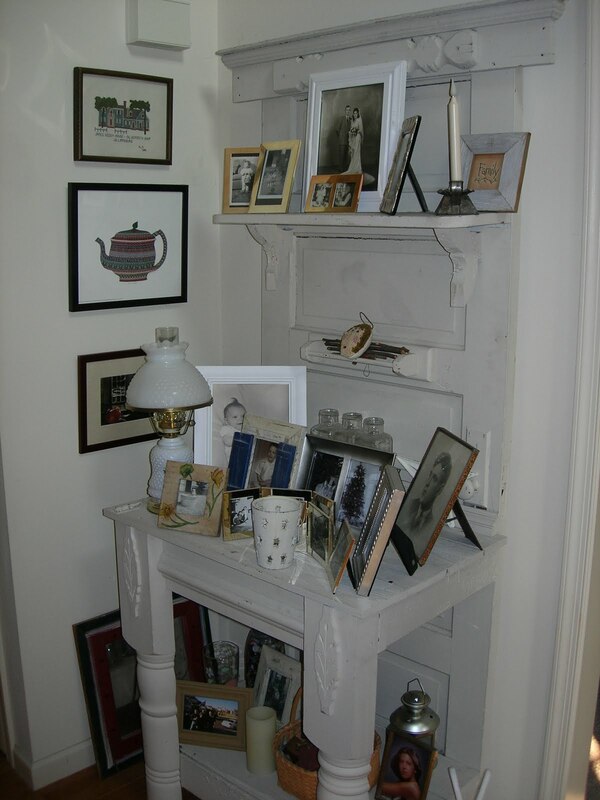 Do you think it should be called a hutch or a curio cabinet? Or just a quirky artistic sort of weird thing. I also love anything painted white and I love old things. I love wondering about all the different places all the pieces of my white thing came from. A farmer’s wife leaning on her wooden front porch railing or a child home from school slamming a cupboard door looking for cookies…all of these are in my white thing. I really do love my white thing. Can you see the door in my white thing? I love the carved feathers, too. Cookie Madness’s No Fail Pan Cookies…a family fave!!! Oh, and I am one of the folks who thinks it's lovely. I do see the door! That is awesome!